Color selection: This hourglass is available in Padauk/Cherry only. Running times: 30 minutes, 45(+$24.00), 50(+$24.00) and 60(+$24.00) minutes (Default running time/30 minutes * Maximum running time/60 minutes) - Custom filling using customer supplied material is also available. time (+/-) it is permanently sealed and mounted in the custom made hand polished solid hardwood case. 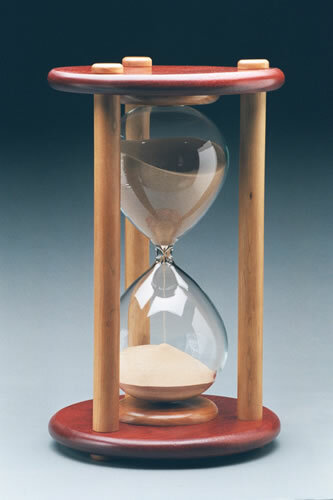 This hourglass case is made of two different hardwoods. Padauk is the main or dominant color. Cherry is the secondary color is that of the spindles and accents. Case size and running times are approximate.